CCA was founded in 1983, but its roots can be traced to the late 1970s. Tom Beasley, chairman of the Tennessee Republican Party, was at that time serving on a committee charged with choosing a new state corrections officer. Beasley’s research revealed a system plagued by high turnover, tight budgets, and overcrowding. The experience made him begin to wonder if there might not be a private sector solution to this growing public sector problem. By 1983, Beasley was convinced that the application of a few simple business practices could transform the corrections system from an inefficient bureaucracy into a profitable enterprise. He recruited his former West Point roommate, Doctor (“Doc”) Crants, as well as Terrell Don Hutto to help bring the concept into being. The troika’s talents and experience melded excellently. Beasley had vital political connections. Crants brought an M.B.A. and a law degree, both earned at Harvard, to the table. Hutto possessed sterling corrections credentials, having not only directed two state prison systems, but also served as president of the American Correctional Association. “We’re on the ground floor of a multibillion-dollar industry,” Beasley gushed to Financial World in 1985. The door swings both ways. In 2010, New Mexico Corrections Secretary Joe Williams came under fire when he declined to penalize two private prison companies who had amassed violations for inadequate staffing levels and improper record keeping during their operation of the state’s prisons. For years Williams, who worked as a warden for GEO Group before joining Gov. Bill Richardson’s cabinet, has not collected penalties against his old employer and Corrections Corp. of America (CCA) despite increasing evidence that both firms regularly violated a contract rule requiring certain staffing levels at the four facilities they operate. Stacia Hylton, President Obama’s Director of the US Marshals Service, ran a private prison consulting company that had a $112,000 contract with the GEO Group. She ran this company while still working for the DOJ as a federal detention trustee. In 2010, the US Marshals Service accounted for 19% of the GEO Group’s revenue. There’s Money In Them Thar Prisons! CCA, which is publicly traded on the New York Stock Exchange under the ticker symbol CXW, took in nearly $1.7 billion in revenue in 2013, 100 percent of which came from taxpayers via government contracts. It had profits of $300 million in the same year–almost double the previous year’s profits. In early 2013, CCA transformed itself into a real estate investment trust (REIT), a restructuring designed to reduce the payment of federal income taxes. In the first quarter of 2013, the firm realized a $137.7 million income tax benefit related to the company’s recent conversion into a REIT. In New Mexico, in 2013, CCA sought exemptions from state & local taxes and even sought a refund of the previous three years’ worth of payments to the state. The dispute was over a prison in Torrance County that housed federal inmates, and withdrawal of local taxes could have cost local governments tens of thousands of dollars per month. The largest city in the county was already operating on 4-day weeks as a “cost-saving” measure. Private prison companies don’t just use their financial success to reward executives and pay accountants for tax-avoidance schemes though. They spread the money around to lobbyists and political candidates. The relationship between private prison firms and government has been key. From the very beginning, when Tom Beasley started CCA, there have been close relationships between private prison companies and government regulators. There have also been close relationships between the companies and state elected officials who make the final decisions on privatization opportunities. Being a nice guy only gets you so far in the lobbying world. But being a nice guy with money? Hey, that buys you a seat at the table and can often lead to private prison employees being appointed to government oversight positions. For instance, in 2011, Maine Governor LePage appointed Joseph Ponte, a former CCA warden with a spotty record, to run the state’s prison system. Ponte had previously headed a CCA jail in Panama City, FL where the county fined CCA $140,000. After that, he worked in CCA prisons in Arizona, Mississippi, and Nevada. At the time, Maine had no private prisons, but CCA’s investment of in LePage (a $25,000 campaign contribution), got the conversation off to a good start. In 2012, The GEO Group’s Political Action Committee received $470,564 and spent $331,425 on federal races. 72% of its contributions went to Republican candidates. The GEO Group spent $240,000 on lobbying Congress and federal agencies in 2012. 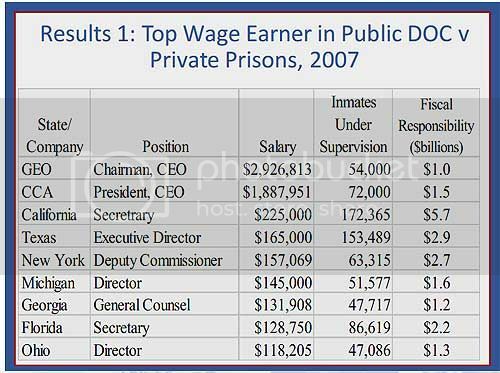 Since 2008, the Corrections Corporation of America has spent at least $970,000 a year on lobbying, however, in all of its federal lobbying reports it includes a disclaimer that it does not lobby for or against policies that would determine whether an individual is incarcerated. GEO has been less consistent in its lobbying efforts and has spent anywhere between $240,000 to $660,000 a year on lobbying since 2008. It’s a nice, tight circle: donate money to candidates; hire the right lobbyists (preferably former government workers with insider access); charm elected officials into hiring your own employees for government positions; and surprise! Suddenly, the idea of prison privatization seems like an idea whose time has come. But still, someone has to write the legislation, and one of the busiest groups in the country for that sort of thing is the American Legislative Exchange Council (ALEC). With its history on gun legislation, mandatory minimum sentences, abortion restrictions, and immigration, the group is pretty much a corporate-financed laboratory for bad governing ideas. Yet it wields a huge amount of influence. GEO Group sponsored ALEC events, including “ALEC AZ Night in Washington DC” in 2009. Management & Training Corporation attended ALEC’s 2010 annual meeting. As we’ve seen, private prison companies have managed to seed their own former employees throughout the state and federal prison system and brought former state and federal employees into high-level management positions. This is the kind of insider access and deal-making needed to negotiate favorable government contracts. In Part 3, we described how limitations on prison inmate medical expenses reduces financial risk for for-profit companies by transferring the cost to the public prison system. Health care is a big expense: even with the limitations, it’s the third largest line item for California prisons run by CCA. But while medical limitations in contracts limit risk, the biggest profit center is undoubtedly “guaranteed occupancy” clauses, whereby states guarantee occupancy levels of 90% or higher. If the state just doesn’t have enough criminals to fill the beds, it has to pay a fine. I had planned to fold this topic into today’s installment, but we’re already a 1900 words, and I’m sure it’s stretching your attention span. So we’re turning LIA’s six-part series on prison privatization into a seven-part series as of today. Tomorrow’s topic will be the effects of guaranteed occupancy on state budgets, sentencing guidelines, and surging prison populations of non-violent offenders.